Lets get away from all the sporting news for a while and talk about some of the other stuff going around our favorite club Valencia CF. Long story short the Valencia court has blocked an agreement between the city council and Valencia CF when Juan Soler was president to use the ground around the Mestalla to build a hotel. 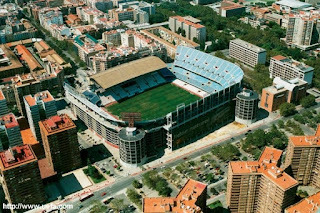 The problem is that while Mestalla owns the ground in its original plan or contract it was supposed to be for sporting development, meaning additional fields or dressing rooms or stuff like that and the previous owners have argued that the land was sold cheaply and they were being lied to that it will be used to build sporting buildings and the court ruled in their favor. You may ask why do Valencia CF even need a hotel? - Well its a way to increase the value for the land for one, as you know Valencia is looking to sell the current stadium and having a hotel next to it will certainly increase the price, but more importantly Valencia CF may sell all its land, including the hotel to build and if it doesn't manage to sell it, well then the hotel will bring additional income to the club. Valencia is a tourist city and there are quite a few tourists from all over Spain and European countries so building a hotel is a good business.